When connecting to a database via SSH host, there are a few extra steps. NOTE: You do not need to connect to your database via SSH. This is optional and for if you want to connect this way. First follow the instructions found here for connecting your database. You need to whitelist Grow's IP addresses, create a read-only user, and get the connection info like host, database name, username and password, etc. SSHHost: The Public IP for the server. SSHPort: This is most often port 22. 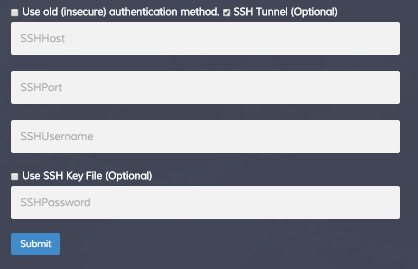 If you want to use a keyfile instead of a password, you can check 'Use SSH Key File' and then upload your keyfile. If you are not able to or don't want to directly connect to your database directly, you can first connect to a server that has SSH access to your server, and Grow will then connect to your database through that server. If your database is on your SSH server, your database Host would be 'localhost', and your SSHHost would be the server hostname.